In order to power the uniPulse, you need to install a few additonal components. Due to the high voltage after the transformer, an additional 15V regulator must be used (7815). The capacitors should have a voltage rating of at least 35V, more is ok. Connect the uniPulse V+ and V- wires as shown in the picture. Trigger are very straight forward. Most triggers are soldered to the legs of diodes on the voice boards. 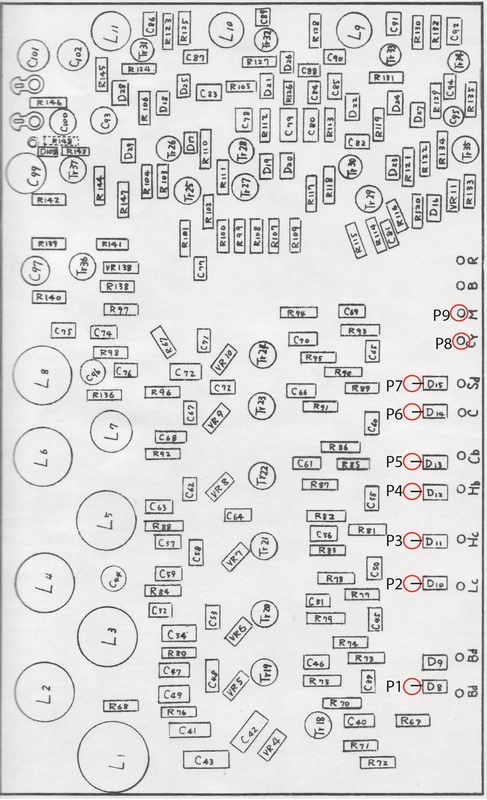 Cymbal and Maracas triggers are simply connected to the solder points on the voice boards. It is also possible to control the Brush (B), but without testing it is hard to tell exactly how. This will be updated as soon as this information is available. 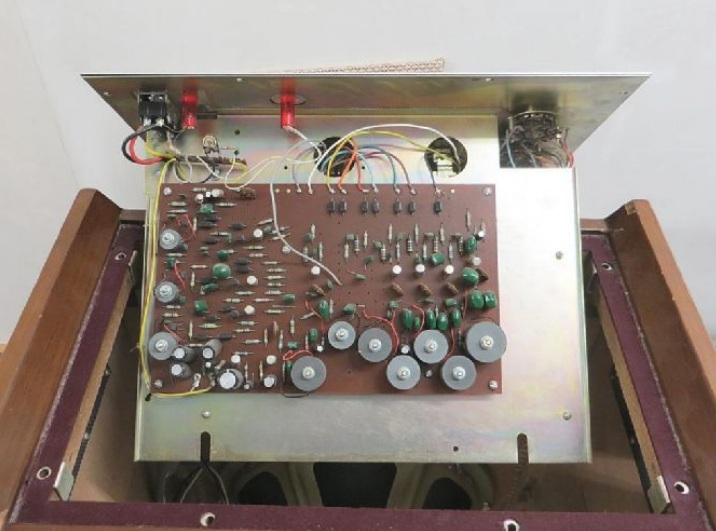 As always syncing the drum machine to the midi clock is optional and requires additional circuitry. 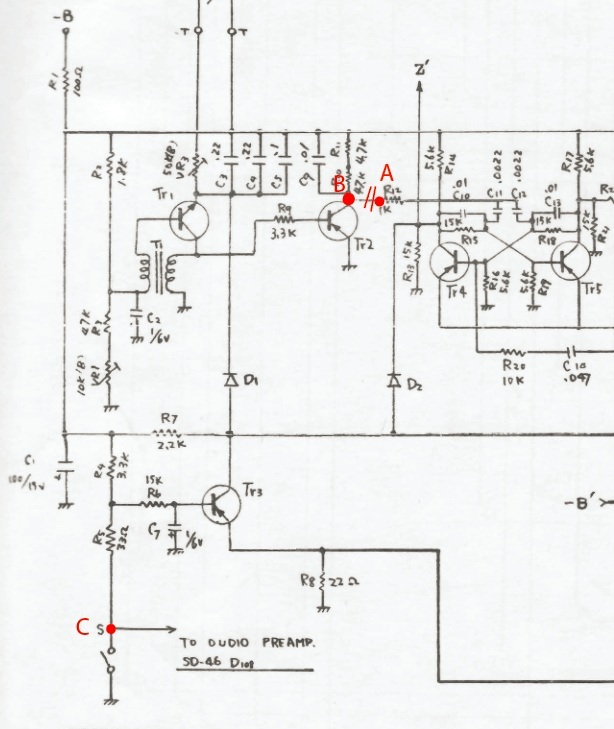 A level shifter is needed for the start/stop signal. Two pole switch (included in the kit) is used to switch between internal clock and midi clock. 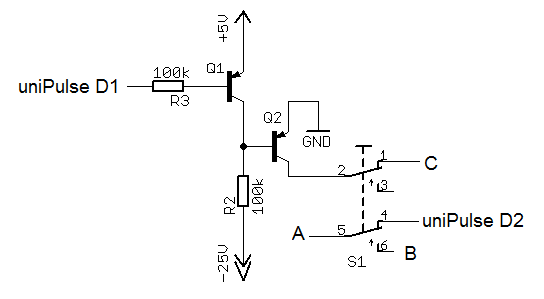 In order to access points A and B, desolder one leg of R12. A is connected to the resistor, B is connected to the board where the resistor was connected originally. Point C can be directly connected to the Start/Stop switch.